Anyone who loves the outdoors and wants to take their experience up a notch should consider getting a compass watch. They offer so many different functions that are useful in the outdoors. In addition to acting as a compass, they can also tell you everything from weather forecasts to current altitude. We researched some of the best products available and put together this guide to help you find the best compass watch for you. First, here are some features to keep in mind. Waterproof: You’ll notice that not a lot of these watches are technically waterproof. Really, all that means is that you can’t go swimming in them or submerge them. They’re all water resistant and will be fine on a rainy day. 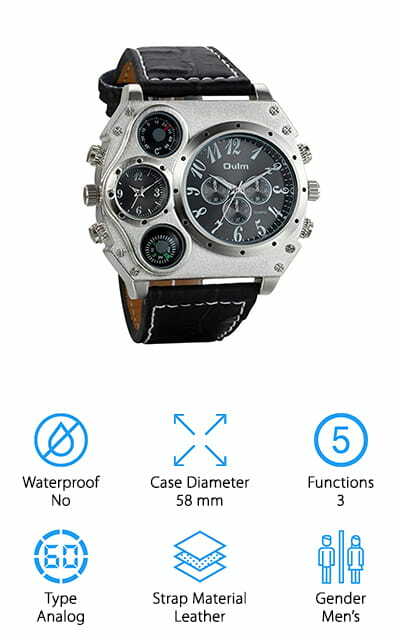 Case Diameter: If you like big watches, you’re in luck. Because these watches provide so many different functions, most of them have multiple dials. So, that means they have large displays. How large? They range from 45 to 58mm. Functions: Obviously, these watches all tell time and have a compass function. There are a lot of other things they can do, too. Weather forecasts, alarms, timers, as well as altitude, temperature, and pressure measurement and recording. Type: There are only 2 kinds of watches, analog and digital. We found some great options that are both digital and analog. And, get this, there are some that have both digital and analog functions, the best of both worlds. Strap Material: There are a few different strap options with these watches. You’ll find leather, resin, polyurethane, silicone, and plastic and the material matches the rest of the watch. The main thing is that you choose one that’s both comfortable and durable. Gender: Most of these are technically men’s watches, though some are unisex. If you’re a lady, you can wear any of these watches. Just keep in mind that they’re all pretty big and choose the one that fits you the best. Now that you know what to look for, let’s take a look at our top picks. Here’s the deal, we put our top and budget picks at the top of the list. That way, if you’re in a hurry, you can get a good idea of the range that’s available. Stick around until the end if you can, whether you’re looking for an analog or digital compass watch, you’ll find a lot of great options here. Let’s go! 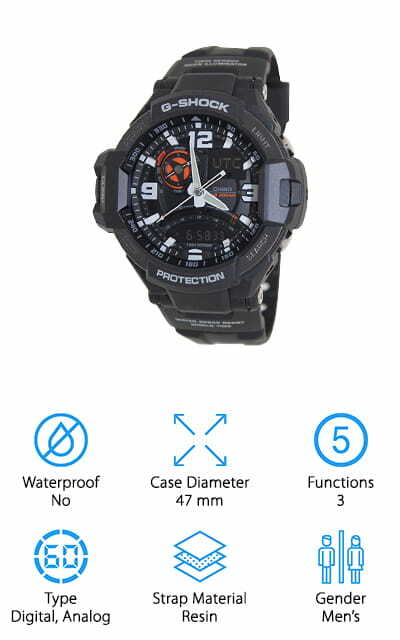 Our first choice for best tactical watch is the Casio G-Shock Aviation Watch. It has both an analog and digital display. While it’s not waterproof, it’s water resistant up to 200M. 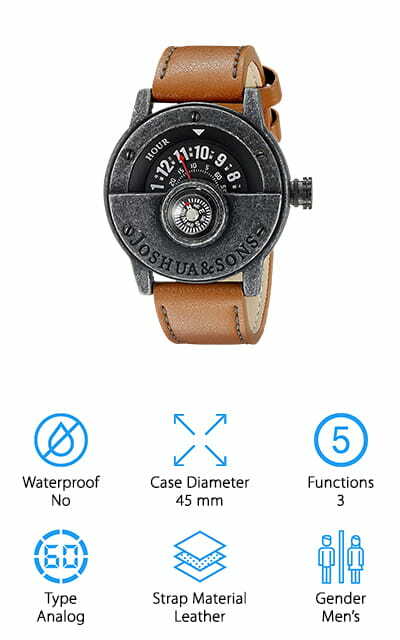 This watch offers some cool features. For one, the digital compass measures and displays direction by using 16 different points ranging between 0 and 359 degrees. It displays temperature, too, from 14 to 140 degrees F. It allows continuous direction readings for 20 seconds. Activate this function and the second hand points north while the direction you’re facing shows in the upper display. It also has bearing memory so you can store these measurements for later reference. The face has large, easy to read numbers and the hands glow at the tip so you can read the time even in the dark. The best cheap compass watch just also happens to be our budget pick, too. 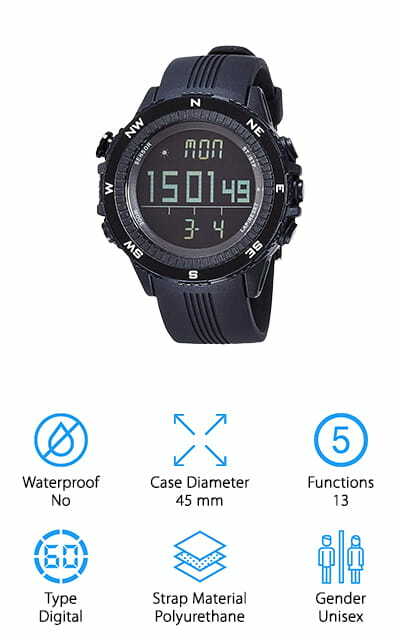 LAD Weather Compass Watch has a lot of useful functions, including a weather forecast that tells you whether it’s sunny, partly cloudy, cloudy, or raining. It also has an altitude graph that records and rests on the hour, a barometer that displays a sea level pressure graph, as well as a digital compass, thermometer, timer, alarm, calendar, and backlight. You can also change the way the date is displayed and choose between a 12 and 24 hour clock. This is a great choice for climbing and hiking. It displays the weather based on pressure changes so you can be prepared when you’re out on the trail. Plus, the altitude, pressure, and temperature readings can help you change course when needed. The Timex Expedition Shock Watch is a true survival watch. It was designed for with harsh outdoor environments in mind. One of the first things you’ll notice is how durable it is. The extremely rugged with flat buttons, large hinges, and a durable resin case. Although it’s not completely waterproof, it’s water resistant up to 660 feet. It’s safe to use for water sports and you don’t have to worry about it in the rain. The reverse LCD display shows light numbers on a dark background which blends in well with the design and is also really easy to read. The strap is made of resin and is lightweight and really comfortable. That’s not all, there are some really nice features, too, like a digital compass, multiple alarms and timers, a hydration reminder, and calendar. 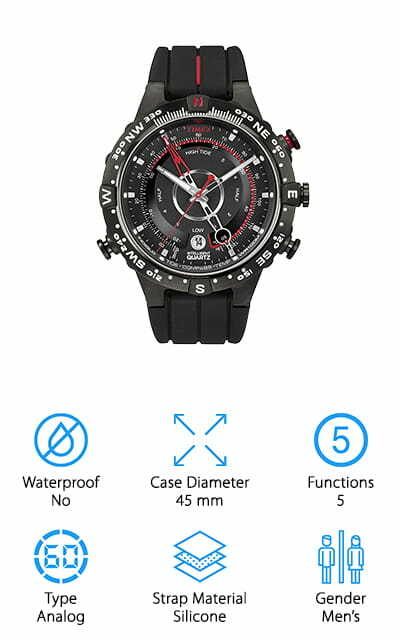 Next up is the La Crosse Technology Compass Watch, a water resistant watch that’s great for any and all outdoor adventures. 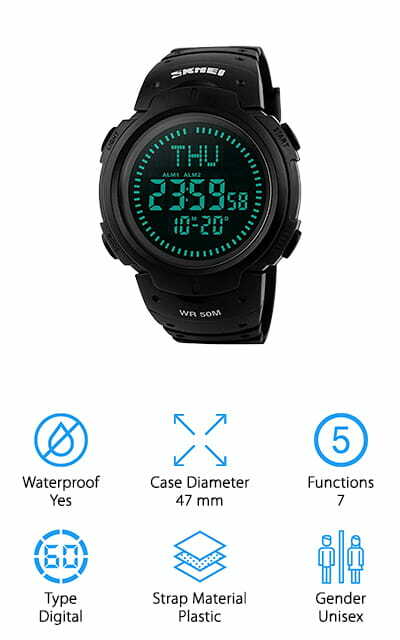 This watch is not waterproof but the case is water resistant up to 30 feet so splashes of water or getting caught in the rain won’t cause any damage. 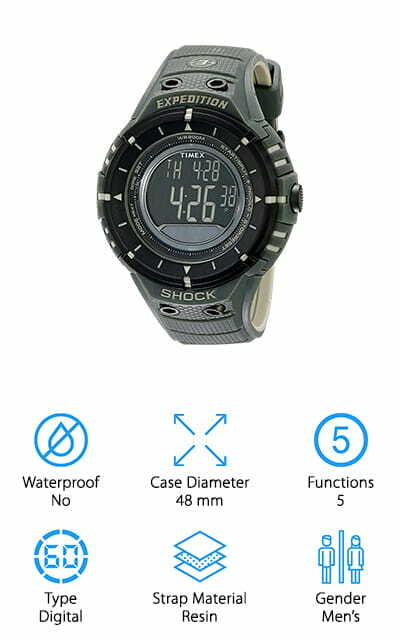 This watch has a lot of great features that come in useful when exploring the outdoors including an altimeter, compass, barometer, and even chronograph modes. Sensitive electronic sensors measure altitude, direction, pressure, and even put together a weather forecast. All you have to do is set the barometer first for the accurate results because most of the other readings are obtained using the pressure as a guide. One more thing, you can change between imperial and metric as well as Fahrenheit to Celsius. The Casio Triple Sensor is a great outdoor watch that’s packed with useful features. This a large, rugged style that has a lot of great features any outdoors lover can appreciate. The durable resin case can handle a lot of bumps and bangs without affecting performance. The digital compass, altimeter, barometer, and thermometer all come in really useful when you’re camping, hiking, or climbing. There’s also an LED backlight that allows you to see the watch face in the dark as well as 31 different time zone settings to choose from. And get this, you don’t even have to worry about changing the time forward and backward when it comes to daylight savings. All you have to do is easily turn it off and on. The calendar is preprogrammed through 2099 plus it works as a stopwatch, timer, and alarm, too. If you’re looking for the best compass watch for sale, take a closer look at the Timex Tide Temp Compass Watch. It has a particularly sporty looking design that’s perfect for outdoor sports and adventures. This one has an awesome compass that you can activate when you need to. Just press the button and the compass will face north. And here’s the cool part, after 20 seconds, it turns off and the watch returns to normal functions to conserve as much battery as possible. There are some other really cool functions, too, like a tide tracker and temperature sensor that will help you have a more fulfilling outdoor adventure. This is an analog watch that features quartz movement, in INDIGLO light so you can read your watch at night or in low light conditions, and 100 meter water resistance. This Sports Watch from Pyle is next in our compass watch buying guide. It has a clean, sporty style and a lot of awesome features to take advantage of in the great outdoors. 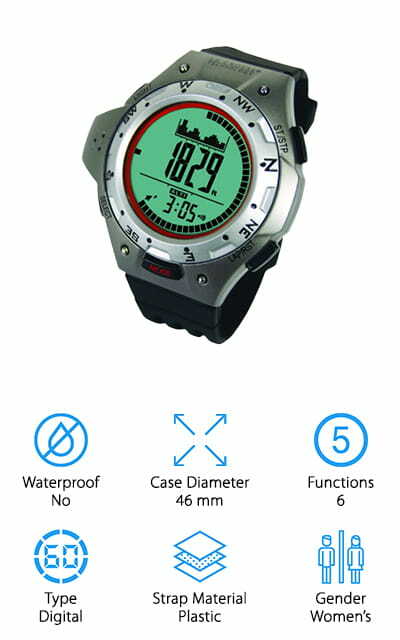 This watch shows maximum and minimum altitude and temperature and even keeps track of accumulated ascent and descent. There’s a built-in pre-programmed digital calendar and it can recall your data for up to 34 hours. The default display shows the time down to the second as well as the month and day. There’s also a weather forecast icon which displays one of 4 different weather predictions obtained from the current pressure readings and the changes over time. It will tell you if it’s sunny, partly sunny, cloudy, or if precipitation is in the forecast. It’s easy to see how anyone adventuring outdoors will find a lot of applications for this watch. SKMEI has an awesome military watch that’s built for the outdoors. 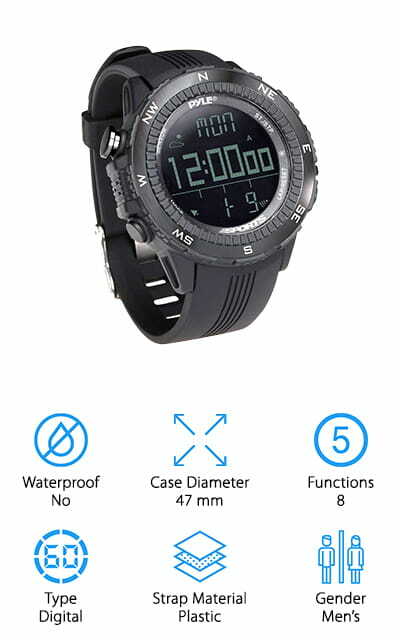 This watch is waterproof up to 50 meters and is made from tough, durable materials that can stand up to the elements. The plastic case is super durable and looks sleek and stylish. The all black color scheme gives this watch a very modern flair that sticks out even more so when using the backlight feature. The band adjusts from 6.7 to 9 inches. It will fit just about any wrist and is a great choice for any man or woman who loves being active outdoors. It has a lot of awesome functions including a time, date, and day of the week display, a backlight, timer, and 3 different alarms. You can choose between a 12 and 24 hour display and it integrates a daylight savings feature, too. Last up in our compass watch reviews is the Avaner Military Watch. While all of these watches are on the large side, this is the one to pick if you like a really large, visible face. It looks really stylish, too. There are 4 dials including a temperature and compass dial. It has 2 different time displays, this is a great watch for travel. Set one clock for the country you’re in and one for home. This watch isn’t waterproof but it is water resistant. You can wear it day to day and not worry about getting it wet during a rainy trail hike or while simply rinsing the dishes. The leather band is really comfortable and has a durable stainless steel buckle. It’s available in 3 different colors, too, so you can find the right one for you.